The snow was calling to him on a sunny afternoon, so our little boy ran outside to play. The temperatures were rising, and there wasn’t much snow left. The time ticked by, though, and he still hadn’t come back inside. I went to check on him and found him pushing an enormous snowball across the yard. Two other big snowballs were sitting nearby. 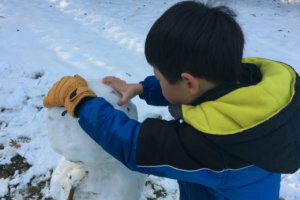 Our little boy was building a snowman. Our sons never want me to take photos of art in progress. They only want me to capture finished masterpieces. And I know when I’m not needed. So I went back into the house. A few minutes later, though, our boy came knocking at the door. He needed a carrot. And chocolate chips. And something for the eyes. I was more than happy to help. I carried my contributions out to his construction site. The snowman was magnificent. It was almost as tall as our son, and he had put it together on a sunny day, using a meager amount of snow, and working entirely on his own. As I watched him put on a few finishing touches, I thought about how amazing it is that a child can find so much joy in some frozen water and a couple sticks. Our son entertained himself for more than an hour, working with determination and focus and creativity. He couldn’t wait to bring that snowman to life. All he had was a little snow, a big idea, and the interest in making it happen. When he was finished, we took some pictures. We both know the snowman won’t last. He’ll melt away. 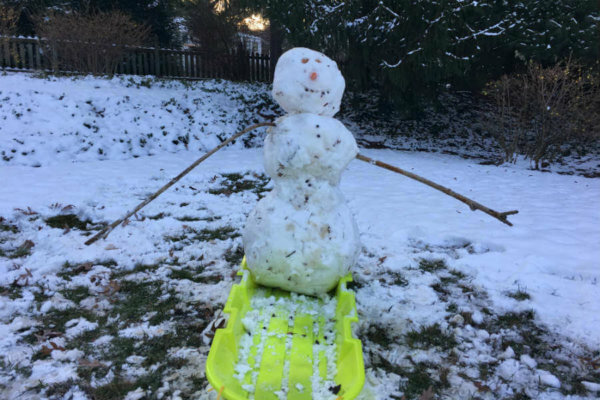 More snow will come, and we’ll build another snowman, and forget about this nameless snowman that was so much fun to create. Or maybe we’ll always remember him and compare all future snowmen to him. Meanwhile, why am I worrying about finding the right toys for Christmas morning? We should just ask Santa for one good snowstorm on Christmas Eve.